We are all familiar with the afternoon slump and this urge to nap on your desk… Maybe the cup of coffee is just not enough to keep you awake and the office candy bowl seems like not being the most reasonable option (ok, maybe just one…). Well, did you know that it’s not sugar, but protein that you need to beat an afternoon crash? 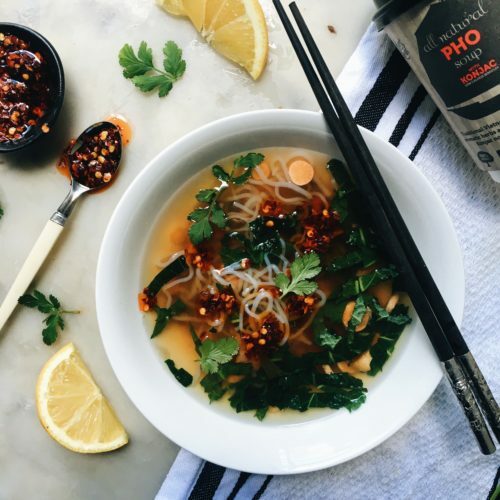 So swap your usual cereal bars and other biscuits for this quick, healthy and delicious afternoon snack created by the beautiful Holly from The healthy Hunter blog, using our Hart & Soul Pho cup. It will fight fatigue and keep you moving between lunch and dinner. See you after the finishing line? Place the chopped vegetables and contents of the Hart & Soul Pho Soup sachet into the cup. Fill to the market with boiling water and let stand for a couple of minutes. To serve, either keep in the provided cup or transfer to a bowl and top with coriander, chilli oil and squeeze the wedge over it.